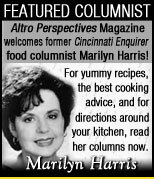 Home Articles & Columns News & Features News & Features What's in a Name? "From the St Marks Bell Tower in Italy, to the Bell Tower in Mainstrasse Village, Covington, Ky”; “from Kings Island’s Eiffel Tower in Cincinnati’s amusement park to the regal Eiffel Tower in Paris, France”, we are here at the right time, at the top of our game, as the Kings and Queens of modern revolution, but also as those who serve others, helping readers connect with new and important info – including the funny, lighter fare too. Laughter is good medicine and gets us all through our days much better, and it's great to be able to laugh at ourselves sometimes, but we need to start taking our careers and our life paths more seriously. As an unbalanced culture, we tend to do the opposite - laugh at what we do and take ourselves too seriously. In short, we need to be more ALTRO!